Today was our last day here and despite the military campaign in Gaza and the shelling of southern Israel, it was a perfectly beautiful and calm day in Tel Aviv. Not one cloud in the sky, 75 degrees, a light breeze off the sea, and we spent the entire day outside wandering around Jaffa and walking 5 miles back to our apartment on the Tayelet (walking promenade) along the Mediterranean. 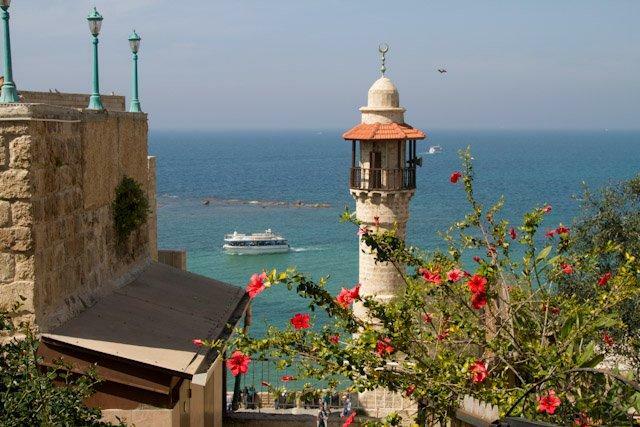 Here’s one of Chuck’s pictures of Jaffa and one of Tel Aviv from Jaffa from today. Don’t you love that incredible blue sky? As we strolled and periodically stopped to feel the sun on our faces, almost trying to store up warmth to take home, I thought about what I wanted to say in this final blog entry from me. (There will be one more, from my guest writer Chuck, about the healthcare system in Israel. He’s been visiting with healthcare leaders here, but he’s been so busy photographing and posting his pictures, he hasn’t had time to write. He promises to do it on the plane.) As you can tell from the title of this post, there’s a lot to say. ISRAELIS: They are energetic, intense, in your face, outgoing, fun-loving, affectionate and sometimes outrageous. They are fiercely proud and at the same time highly critical of their country. I feel right at home with that. We’ve had incredible conversations with many strangers, but especially with cab drivers. In Israel, they are mostly middle-class men who are eager to talk about all the things I’ve explained Israelis want to discuss. Politics, religion, family, country, money, and where did we learn to speak such terrific Hebrew. Yesterday, we rode to Ramat Gan with a cab driver who told us an incredible life story. He is named after his uncle who was murdered 80 years ago in the Old City of Jerusalem by his Arab neighbor. In the first Gulf War, he took his family to Eilat to escape the rocket attacks that were reaching Tel Aviv. While in Eilat, his building in Ramat Gan was hit by a rocket and destroyed. He talked about how exhausting it is to live in Israel, how much pressure there is, and how he is tired of war. He explained that his son, who visited and loved India and returned there to learn Ayurvedic Medicine, now lives in Kauai Hawaii, practicing Ayurvedic Medicine and surfing. He said although he misses his son terribly, he understands why he chose to leave Israel and go to Hawaii. This is such a complicated society. In a few short weeks, my hairdresser, manicurist, housekeeper, various restaurant workers and shopkeepers, and our wonderful tutor Lior have become our friends who greet us warmly, often with kisses and hugs, and whom I will genuinely miss. There is no way that could have happened in such a short period of time back in South Orange. And then there are the specific Israelis we already knew and were delighted to visit with here. 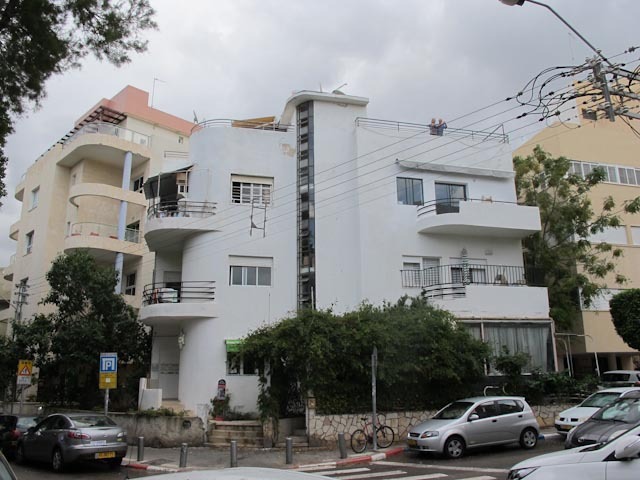 We’ve spent quality time with our friends Nadav and Orlee and their daughter and her fiance, with our family in Haifa, with Lee and Mira and David and Havi in Jerusalem, and with colleagues at Kibbutzim College who have become friends. Israelis, despite their intensity, love to just sit and talk. This is a cafe society and no one rushes through breakfast, a cup of coffee or a glass of wine. We Americans have something to learn from Israelis. 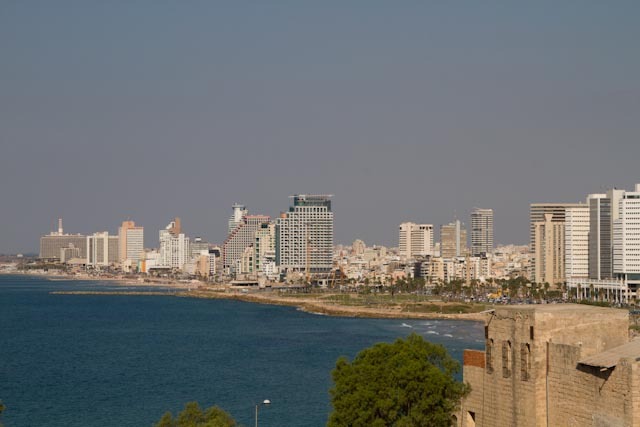 TEL AVIV- We have loved living in a small apartment in the middle of a vibrant, dynamic, happening Jewish city on the Mediterranean. It has been such fun exploring so many different neighborhoods, restaurants, galleries, shops, and parks. Although I’d been rather nervous about coming to spend all this time in an apartment sight unseen except for pictures on the internet (and we all know how misleading those can be), this apartment has been almost perfect. I still don’t love the 4 flights up, but I am used to it by now. We love the roof deck, the very comfortable bed, and most of all the location. Almost everyday we have walked 3-6 miles, cumulatively more than I have walked in the past five years! I wore out two pairs of shoes, but my stamina is way up. Here’s a photo of our lovely Bauhaus building with Denise and Jim on the roof deck. This last week, we have wandered all over the city, including along the Yarkon River where Chuck has been rowing. There were egrets and herons all around and it was lovely to see. 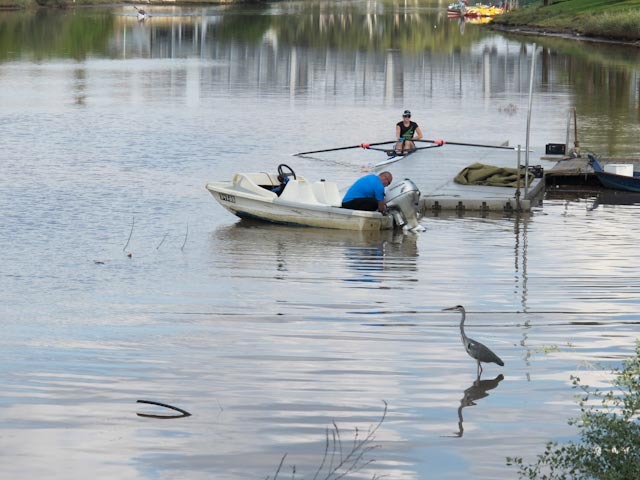 Here’s a heron and a rower on the river. It has been a great joy for me to see Chuck photographing to his heart’s content, composing shots, changing lenses and filters, and waiting patiently for the best picture. Being together, just the two of us so much of the time, has been wonderful. 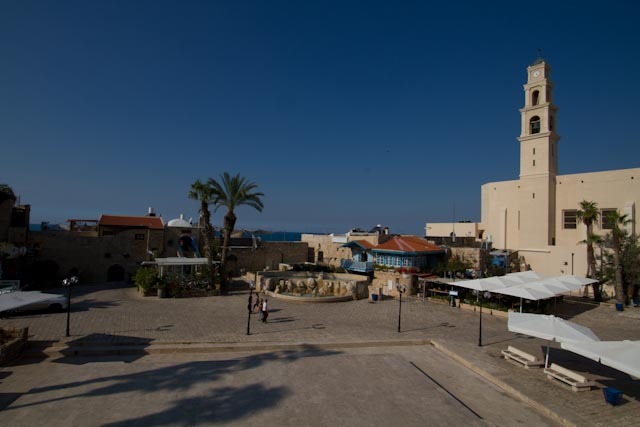 MUSEUMS- Did you know Israel has more museums per capita than any country in the world? I think we were in half of them this visit! (That’s an exaggeration for sure.) Chuck and I love museums, but at home we just don’t make it a priority. What a luxury it’s been to go to almost every single museum we wanted to visit in Tel Aviv. LEARNING HEBREW- Improving our Hebrew has been a wonderful, tangible outcome of our time here. For more, see the prior blog entries on Learning Hebrew. THE LAND- As I’ve written, this is a magnificent country with desert, sea, mountains, farm land, incredible scenery, and a mix of ancient and modern that doesn’t exist in many places, and it is one of the spiritual centers of the world. From our stay in the Negev, to our visit to the Hula Valley, from holy Jerusalem to the hopping scene in Tel Aviv, we have soaked up and loved the land of Israel. SHABBAT- Even though Tel Aviv does not shut down for Shabbat the way Jerusalem does, everyone wishes you Shabbat Shalom, most Israelis have Shabbat dinner with family, and Shabbat is a day of rest and relaxation even if not in the religious sense. In the USA, I am used to being a minority member of a mostly Christian country, but it feels wonderful to be in a country that is openly Jewish. While wandering yesterday, I saw this sign in a kosher restaurant window and asked Chuck to take a picture. I love it- Kosher, so closed for Shabbat, but otherwise 24/6. WAR: Here we are in the midst of a new military operation in Gaza in response to the shelling of southern Israeli towns. War and/or the threat of war has been a part of life in Israel for its entire existence. Now the Arab countries in the region are newly unstable, Hamas is a constant worry, and Iran’s nuclear potential looms large. When my cousin Zilla’s son was born 43 years ago, her grandmother, my great-aunt, said, “Maybe his generation will not have to go to war.” It has been the fervent hope of every parent and grandparent for generations and it is still not true. Americans don’t know what it is like to fear your home will be hit with rockets and how it feels to send every 18 year old off to the army and possible mortal danger. Israelis do, and it is a terrible weight on the society. RELIGIOUS EXTREMISM: When a Jewish woman is arrested in Israel for wearing a prayer shawl and praying out loud at the Wailing Wall and a child is attacked for the supposed immodesty of her school uniform, there is something serious to worry about. The power and privilege of the religious fringe in Israel are unacceptable to secular Jews and something bad is brewing here. THE OCCUPATION OF THE WEST BANK: This ongoing stain on the soul of Israel worries many Israelis who fear what it has done to the society, to its youth who serve in the army and enforce the occupation, and to the ordinary citizens of the West Bank who are not terrorists. It cannot go on forever and peace is still illusive. Our friends Orlee and Nadav tell us they will not step foot in the West Bank until there is peace and clear borders and I can understand why. RIGHT WING POLITICIANS: Yes, there are right wing crazies in the US, but they do not control the government. Many Israelis told us they are fed up with Bibi Netanyahu and they long for a change. But, no one has stepped up as a plausible leader from the more progressive parties. More Bibi is worrisome. That’s a lot to worry about, no? YOUNG ISRAELIS: Spending time with Itai Harari, our idealistic guide in the Maktesh Ramon; our beautiful young friend Shira Levine who joyfully prepares secular Israelis for their Bar and Bat Mitzvahs in a progessive synagogue; our tutor Lior Yatsiv who teaches English and Hebrew to African refugees as a volunteer; the impressive young leaders of ACRI, ASSAF and Mahapach-Taghir; and the Kibbutzim College students preparing to become teachers who work for social justice, all gave me great hope for Israel’s future. THE DESIRE FOR PEACE: In the end, most Israelis want peace more than anything and I believe their Arab neighbors feel the same way. Extremists exist everywhere, but they are not most of the Arabs or the Jews. I have to believe this because I love Israel and want a peaceful future for this amazing country. I have loved writing this blog and I thank you for reading it and for the wonderful feedback you’ve shared. This experience will be with Chuck and me forever and we are grateful beyond words for every minute of it. Thanks so much for sharing your experiences with us during your time in Israel. I have enjoyed reading your posts and looking at the amazing pictures. You certainly inspired me to travel, reflect and really enjoy life’s moments – big and small. I wholeheartedly agree with the above.